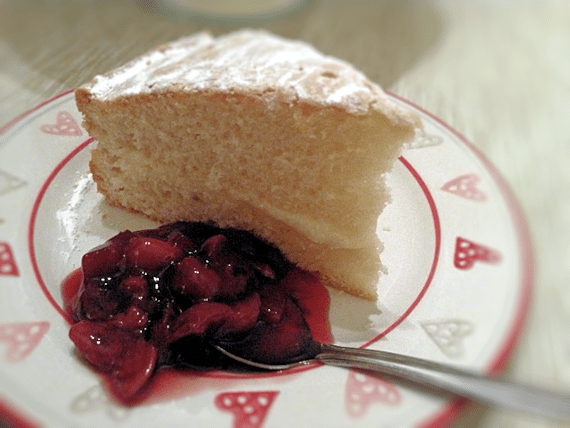 Making a sponge cake is the easiest thing there is to bake. Don’t let anyone tell you that it’s difficult, hard, or in any way something that only bakers can do. The quantities and proportions for a basic cake never change. For the filling on this cake, I don’t bother to weigh as butter icing is just so easy. If you want an absolutely perfect looking cake, you can use a sharp knife to trim round the edges and make it look perfect before sprinkling icing sugar or adding your filling. Add in the eggs and again mix until smooth. Cook in a moderate oven around 160 - 170. You can split the mixture into two tins which should cook in around 35 minutes, but it will take longer if you use one tin and slice the cake as I do. My last cake took nearly 50 minutes to be fully ready and I reduced the heat a little. I use a skewer to pierce the cake and if it comes out clean, I know it's ready. I use cake release spray on my tins, but a good old spread of butter will also help to turn out your sponge once it's cooked. I slice my cake into two portions, allow them to cool and then fill with butter icing. I judge butter icing by eye. I put approximately half a block of soft butter into a bowl and then just add icing sugar in small amounts until it reaches the thickness and consistency that I am after. Spreading the icing sugar on finishes the simple cake and then just sprinkle a dusting of icing sugar over the top. Serve with fruit coulis or sauce.